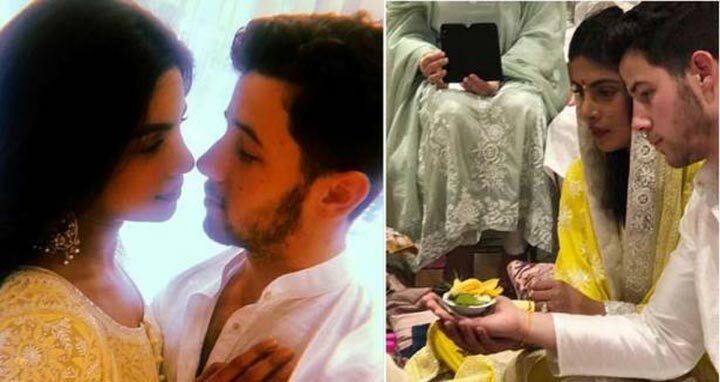 Dhaka, 18 August, Abnews: Bollywood actress Priyanka Chopra and American singer Nick Jonas on Saturday solemnised their relationship with a traditional Indian ceremony in the presence of their close family and friends here. The ceremony, held at Priyanka’s residence, follows months of speculations around the relationship status of Priyanka, 36, and Nick, 25. The photographs from the ceremony did the rounds on social media, but an official statement or update from the celebrities is still awaited. The former beauty queen was dressed in a subtle yellow designer ensemble, and Nick wore a pristine white kurta churidar as he performed the ‘puja’. One of the photographs shows Nick cosying up to Priyanka, who holds on to him, as they stand against a green background with a logo that reads ‘NP’-merged together to denote the amalgamation of the first letter of both their names. The increased activity at Priyanka’s residence since the past two to three days had indicated preparations for a celebration. On Friday evening, people were busy decking up the semi-circular balcony with green foliage. The paparazzi stationed outside the building captured a priest making his way into the house, as well as Priyanka’s cousin Parineeti Chopra-who too was dressed in yellow-apart from a slew of relatives. A party for close friends is likely to follow on Saturday evening. Nick arrived here on Thursday night with his parents-mother Denise and father Kevin Jonas Sr in tow. The Jonas patriarch even carried a big Tiffany & Co bag in his hand, fuelling the rumours about the formal ceremony to celebrate the couple’s engagement. According to international media reports, Tiffany is the jeweller that closed down its London store for Nick to buy an engagement ring for Priyanka, and reportedly the two got engaged on Priyanka’s birthday last month on the 18th. Priyanka is a former Miss World, who established her space in the Hindi film industry with a slew of impressive projects like “Fashion”, “Mary Kom”, “Barfi!”, “Bajirao Mastani” and “7 Khoon Maaf”. She forayed into the international showbiz world with a singing career, and eventually landed the lead role in American TV show “Quantico”. Nick is a popular singer and has also acted in “Jumanji: Welcome to the Jungle”, as well as done TV shows like “Hannah Montana”, “Camp Rock” and “Scream Queens”. In December last year, Jonas, while promoting “Jumanji: Welcome to the Jungle”, had expressed a desire to visit India.